Are you looking for the perfect garlic bread? 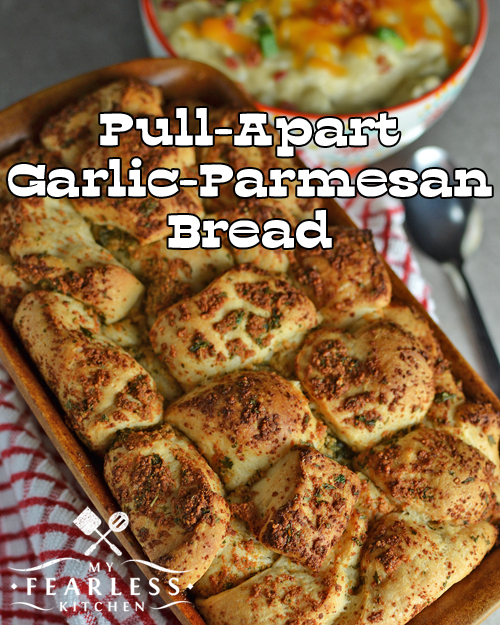 You won’t be able to stop eating this Pull-Apart Garlic-Parmesan Bread. It’s perfect as a side or by itself! I made a different version of this bread a long time ago. It was delicious! In fact, I had to stop making it, because I got myself, my husband, and some friends practically addicted to it! Well, I decided it was time to brush off the old recipe, spruce it up a bit, and try again. I was not disappointed! If you like garlic bread – at all – you will love this bread. It’s easy to make with frozen bread dough (although it does take a little bit of planning ahead). And it is so very easy to eat… You won’t want to stop! 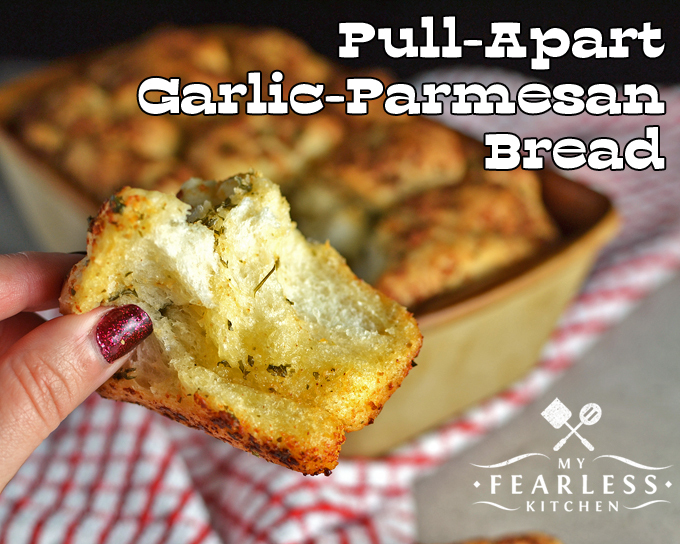 All you need to do is toss chunks of bread dough in a butter-garlic–parmesan mixture, pour any extra butter over the top, let it rise for a bit, and bake it. Easy peasy. I first found this recipe in Autumn with Family & Friends by Gooseberry Patch. I’ve changed it up a bit, but the original version was pretty yummy, too! Be sure to pour any extra butter over the top of the bread (you’ll see what I mean when you read the recipe). Then when the bread sits to rise, all that extra butter runs down to the bottom of the pan and soaks into the bottom layer of dough pieces. When the bread bakes, the bottom layer of bread is like a butter sponge… all that delicious melted butter is inside the bread… and when you bite into it, that yummy melted garlicky butter just explodes in your mouth, and it is so delicious! Like I said… do what you want with that information… share it with your family or keep it to yourself… I won’t tell! Is This Yeast Still Good? If you love garlic-parmesan flavors, I know you’ll also love these recipes! Are you looking for the perfect garlic bread? 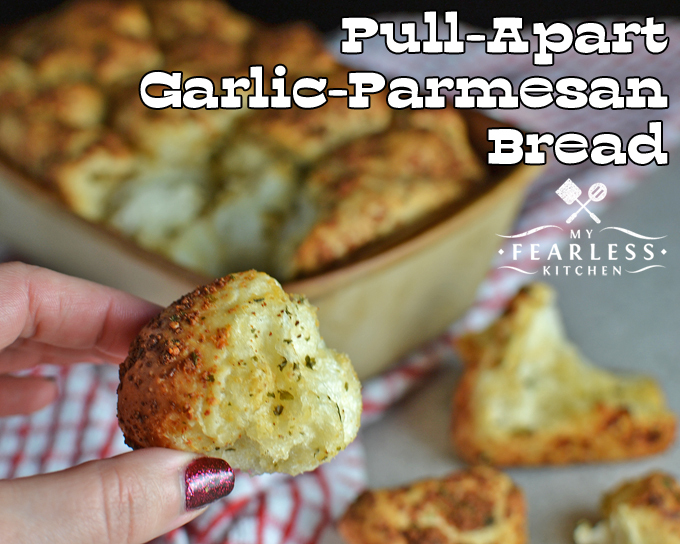 You won't be able to stop eating this Pull-Apart Garlic-Parmesan Bread. It's perfect as a side or by itself! Using kitchen shears, cut bread dough into 1-inch pieces. In a small bowl, mix melted butter, parsley, garlic powder, salt, and Parmesan cheese. Lightly grease a 9" x 5" loaf pan. Dip bread dough in butter mixture, coating all sides. Layer bread dough pieces in loaf pan. Pour any extra butter mixture over the bread. Set bread aside, somewhere warm. Lightly cover and let rise until double, about one hour. Bake, uncovered, at 350 degrees for about 30 minutes, until golden brown.